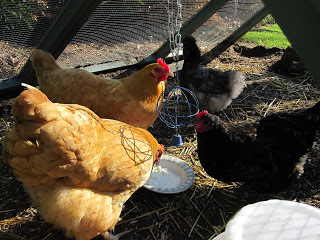 Oyster Cracker, Sunshine and Dolly enjoy their yogurt. The girls love yogurt! It had been a little while since they had some and they were so happy when I arrived with two bowls filled with plain organic yogurt. As I called out to them to announce my arrival, they knew. They saw this time that I was carrying two bowls and that could only mean that yogurt was on its way. The energy at the door was frantic. Oyster Cracker pushed her way through and got the first taste even before I could place the bowls on the ground. Usually, I bring two bowls. Each filled halfway, to ensure that even those on the lowest of the pecking order get to enjoy this delicious treat. 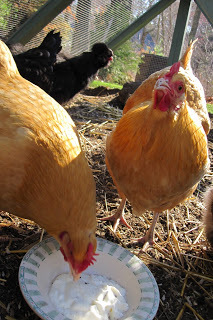 I love watching the chickens as they eat the yogurt. I think this is as much of a treat for me as it is for the flock. Yogurt eating is a messy endeavor. Be prepared for lots of yogurt flinging and feathers dotted with white yummy goodness. 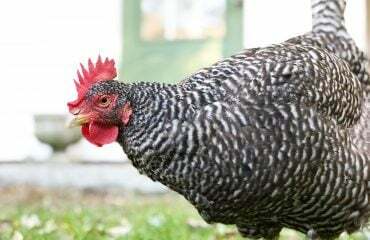 When they do come up for air between bites, their beaks are dipped in gooey yogurt. If only they had longer tongues. 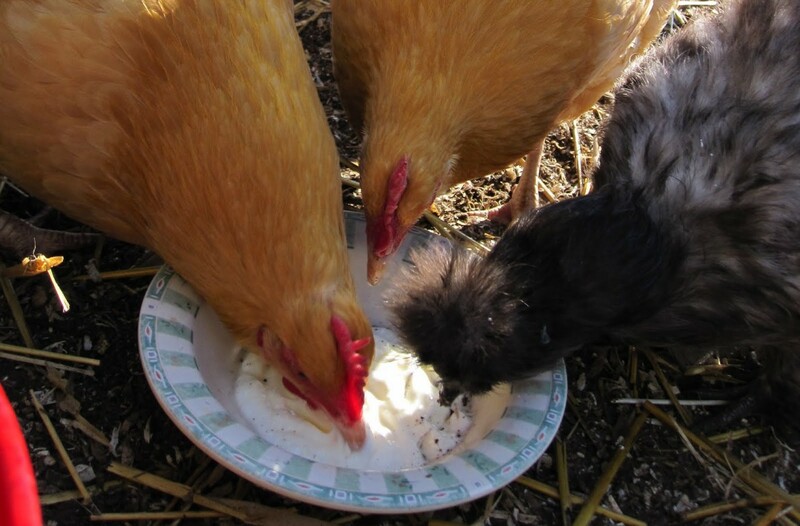 I have always felt that yogurt is beneficial to my flock for a number of reasons. Although some folks say that it causes their chickens to have loose stools, I myself, have never witnessed it. In fact, I have seen the opposite. I find that my chickens are happier when they have the yogurt. 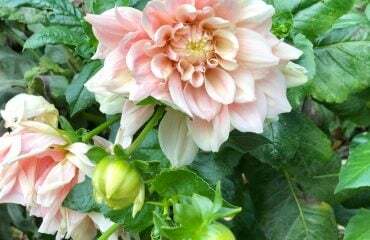 It brings calcium and probiotics to their gastrointestinal system. It helps to maintain and promote the balance of normal bacteria that live in the gut. 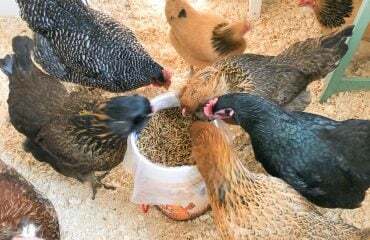 Did you also know that the University of Florida, believes that feeding milk based products to your flock can help prevent egg eating by the chickens?